In the last newsletter I wrote that there were two major tasks outstanding in the Bluebell Heath project at Stanmore Common: to create a nature trail and to put on an exhibition about the project at the Harrow Museum. The exhibition at what is now called Headstone Manor Museum opened on Thursday January 8th and looks great. There’s even lots of activities for children that include worksheets but go beyond that with seeds, stones and even (fake) skulls to handle. Please do go have a look. It’s open 12 noon through 4 PM Thursday and Friday, and 10:30 AM to 4:00 PM on weekends. Meanwhile back on the Common The Conservation Volunteers are midway through putting in the posts for the nature trail. I’m very pleased to welcome new faces to the warden team. Wood Farm now has a chief warden, Harry Lines, and a deputy warden for education, Anne Altaner. How soon we’ll actually get control of the site is less clear. We have agreed that the developer has done all that they are required to do to get the site ready, so as far as we are aware there is nothing stopping handover. Meanwhile Sue Kabel has joined Peter Peretti at Bentley Priory. Together with Simon Braidman she is organizing and supervising a programme of regular weekly working groups, always meeting on Wednesday mornings at 10:30 AM at the Stanmore Common car park before moving off to work on Stanmore Common, Stanmore Country Park or Bentley Priory. All are welcome! Lastly Maria Crastus is working at Stanmore Country Park, principally with John Hollingdale and Margaret Huitson on the east side of the site. Meanwhile congratulations to Maya Dodwell, warden of the west side of Stanmore Country Park, who passed the CS30/31 chain saw exam on the 20th of January. Every autumn we are very pleased to host working parties from the Shree Swaminarayan Temple on Wood Lane as part of Sewa Day and HaMakom as part of Mitzvah Day. Last year these fell on 5th October and 16th November respectively. The Sewa Day volunteers did sterling work on Stanmore Country Park, and we hope this will develop into a closer working association since two representatives of the temple, Naran Khetani and Naman Varsani, now sit on the Greater Stanmore Country Park management committee. Over on Bentley Priory HaMakom (this year joined by BBYO) cleared a great pile of laurel and willow around the Master Oak that was later chipped to form the mulched pathway leading to the bole of the tree. Linda Robinson and the Friends of Bentley Priory have now installed an information panel describing the Master, so the project to protect and inform about this majestic tree is now complete. and vote for Stanmore Marsh. Jane Skelly reported that the regular working parties were continuing on the first Saturday of each month. There were 2 new volunteers. £240 has been raised through the Waitrose Community Matters scheme and the money is being used to replace an old seat with a new bench. The only access to the reserve is now through the church grounds. A letter concerning this state of affairs has been sent to Philip Loveland-Cooper, Head of Corporate Estate at the Council but no reply has been received. Another letter will be sent with a copy going to Cllr Keith Ferry. Peter Peretti took some members of the Forum on a tour of the site on 4th Oct was thanked for this. Sue Kabel has been the Deputy Warden at the site since November and she has worked with TCV clearing understory in an area which has been previously coppiced. More work will take place in the Glenthorne area, where the Laurel has been cleared then putting in Hazel whips. This year will see the end of the Heritage Lottery Fund project. Another proposed project is the removal of Rhododendrons along the Stanburn. How this is to be carried out is to be discussed at the Bentley Priory Management Committee. Information about the planning application for the Princess Alexandra Home, dated 8th September 2014 was circulated at the recent Forum meeting. The plan is to replace the present building with a holiday village style complex located slightly south-east of the present building - that is, closer to Bentley Priory open space. However it also proposes the donation of a significant area of land to the open space. Simon pointed out that there is a significant bat roost there. It was noted that planning application has now run out of time. The issue from the last forum meeting, of contractors from GFL carrying out work that affected the site was raised at the meeting with Mick Wynne on 3rd Sept 2014. He said that GFL were the contractors for Harrow Highways Department, not for Parks, and that he was not informed about this work at all; either in advance or at the time. He said that he would contact Highways and tell them that if work is proposed that will impact open spaces they should contact him so that he can in turn contact the voluntary warden. A Working Party has taken place on the site. Steve will aim to attend the next meeting of the Home Group (who have gained the Big Lottery Fund grant) and pursue the opportunity for getting a volunteer group going. Some of the fence along Wood Lane has come down. Sean Courtman is going to help Claire repair it during the first week of Feb.
Having reported the sewage leak to the Environmental Agency (EA), work is now in progress. Claire has to report back to the EA. Jack Newman, the new project officer for the TCV, came to talk to Claire and Rosemary and to familiarise himself with Pear Wood on 3rd Oct. A TCV coppicing day took place on the 8th Dec; nine volunteers came along and the day went well. Elizabeth Whitbourne from English Heritage visited the Grimsdyke with a finance representative and an ancient monuments’ specialist on 12th Nov. They were very happy with the management of it and funding from English Heritage has been secured for the next three years. Two fallen trees that were blocking the main path were cleared with Steve’s assistance on 25th Sept.
Rosemary gave an excellent talk on Fungi on 13th Oct for the Harrow Natural History Society. Claire and Rosemary also lead a Fungus Foray around Pear Wood on 18th Oct. This was also well attended and among others a large Beefsteak fungus and a ring of Clitocybe were recorded. A young grass snake was seen at the top end of the wood on 8th and 28th Sept. This is the first time they have been seen in the top end of the wood since the work started on Wood Farm. Sean Courtman also came to look at the apple trees in Pear Wood on the 12th Sept with a view to help prune them and get them into better shape. Sean’s visit was followed by one from two of his colleagues from the Urban Orchard Project –Stephanie and Erin-on 1st Dec. There is a nationwide lottery funded scheme to save old orchards and 30 sites will be selected. The trees in Pear Wood could be used to demonstrate how to prune, to save old fruit trees such as these. Claire and Rosemary are expecting to hear before April if Pear Wood has been chosen. However if we are accepted, we would be asked for a donation of £300. For this participants would be instructed on fruit tree pruning. This is the third group that have looked at the apple trees so Claire and Rosemary are not holding their breath. Regarding SSSI status: Steve reported that we are still seeking funds to carry out the saproxylic invertebrate survey recommended by Natural England. The next TCV visit to carry out work on the Dyke is planned for 26th Jan.
Dave Bolton reported work has continued on grass and nettle cutting to keep the path edges clear. Litter clearance has continued as always. He has worked hard on topping up the paths with the material left by contractors (43 wheelbarrow loads) and the general consensus is that the paths are now high enough. Ditches have been cleared and Harrow Parks Department need to clear the ditch end to the drain. This was raised with Council Officers on 14th Jan. The major flooding last year has been avoided so far by the judicious use of piping and railway sleepers (ed. Don’t ask). Exposed tree roots on the path have been covered. It is planned to plant more snowdrops and Peter indicated that he has some to spare. Dave receives regular complements about the site and over Christmas even received a present from a user. Following clearance work, Kingfishers have been seen twice on Yeading Brook as well as a Little Egret. Dave again expressed concern about the safety of the exit opening out on to Cannons Lane at the top of the steps. This matter was raised with Council Officers on the 3rd Sep following the last meeting and it has raised again at the meeting on the14th Jan. There has been no progress either on the path within Roxbourne Park and this was raised at the meeting too. Simon reported that 565 hours of work have been carried out on Bluebell Heath and the area is looking pretty good. Dead Bracken has been cleared and scrub reduced. Some plants have been translocated from the heath and the new scrape to maintain the bare heathland habitat. The Bluebell Heath project is on time except for the Nature Trail. The next step is to put in the posts with roundels. The Bluebell Heath project exhibition at Headstone Manor is now open and runs to Sunday 26th April 2015. The exhibition looks very good. Simon and John Winter will be giving the Tuesday talk at 2pm on 17th March,, at the museum on the restoration of Bluebell Heath; cost £3.50. 105 hours of work have been carried out in Oakmead removing the old Bracken etc. The young Aspen trees there are an important wildlife resource. Three successful Guided walks have taken place: a night-time Safari, a walk for Bushey U3A and a Fungus Foray. Sixty teenagers from The Challenge Network carried out clearance work on 28th Sept. The TCV day on 6th Sept was not well attended and a reduced price has been agreed. Data from the Botany and Bat surveys is still to be analysed. Some interesting invertebrates have been found including a species of Rove Beetle in the Purple Moor grass. At the meeting on June 3rd Steve reported that he had written to Grove Farm on 20th April 2014 regarding the maintenance of one of the ponds but had received no reply. Sue Anderson passed a contact phone number on to Steve and through this he has a contact for the owner of the farm. Maya reported that clearance has been carried out around the Siberian Crab Apple and the Goat willow. On Sewa Day some path widening was carried out. National tree week was celebrated with a winter tree walk. It was a lovely walk and Woodcraft Folk and leaders came along and participated in tree-themed activities. Maya is attended a Chainsaw course. She will be carried out amphibian survey work. A plan is to plant willows at the edge of the site with Wood Farm. Since the last meeting we have been concentrating on path widening and bramble removal. Peter Elton has brought along his son’s wheeled strimmer and created wide paths over most of the reserve. The regular users are delighted. We also widened the path from the Scout’s Field down to the stream in order that Trimlock would have good access to put in the Green Grid bridges. Trimlock have now completed both of the green grid projects; that is the bridges and the drainage work. Photos of the bridges courtesy of Maria Crastus have been tweeted. We will now have to monitor Six Acre field for flooding. Also on the HNCF Twitter page is an appeal for wildlife recorders. One volunteer so far, Peter Elton, who will regularly monitor birds over the Greater Stanmore Country Park area and Bentley Priory. Maria joins us every other week; also Marian and Norman on our monthly work parties. Peter has been there practically every week and has finished cutting the paths. Steve spent two days brushcutting the bramble that had grown up around the birch stumps. The Conservation Volunteers (TCV) then did an excellent job raking up this bramble and then cut back more bramble nearby. 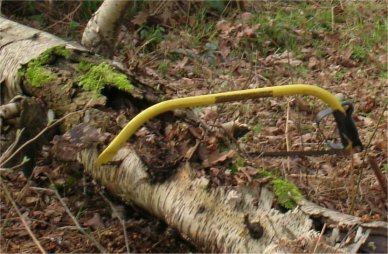 I have found the scythe is a good tool as it cuts the bramble canes off at the base which makes them easier to move in one piece. Marian is a dab hand with this tool too. Two more robust blades have been purchased for this work. Sewa Day this year took place on October 5th 2014. Steve and Maya coordinated the wok in the morning and in the afternoon more work took place raking bramble which Steve had previously brushcut from the eastern part of the reserve. There have been recent instances of wildlife being chased by dogs and this issue is being addressed. Robert Stone reported that New Zealand Parrot’s Feather on Caesar’s Pond was spreading. Denis Vickers stated that it will be needed to be treated several times to clear it. The matter will be referred to Council Officers at the meeting on 14th Jan. There are now Terrapins in Spring Pond but they are currently in hibernation so no action can be taken at the moment.The problem of the section of fence from the Rugby field in Caesar’s Pond was referred to Council Officers at the meeting on the 3rd Sept. Apparently it is still there and the matter will be raised again on 14th Jan. There has been a problem again with horses on the Common. Robert has previously spoken to both stables about the problem and he will visit again and ask them to remind their customers as to where they should take their horses. Harry Lines and Anne Altaner have been appointed as warden and deputy warden for education respectively. Steve reported that as far as he is aware the only outstanding issue preventing handover is installation of the information panels at the car park and the viewpoint. Anne will try to be present when the information panels are fitted. Projects were suggested for work at the SW corner of Wood Farm. Where the contractors have built a bridge across Cloisters Stream at this point, to get onto Wood Farm requires climbing a steep bank. This is almost impossible in wet conditions. It would be good for steps to be put in here. Also proceeding along the gas main path to enter Stanmore Country Park again, a bridge should be installed for similar reasons. This is important as a proposal has been made to re-route the access path of the London Loop along this way.